Location: Between Junction 2 and Junction 4. The guns of HMS Belfast are said to be trained on this MSA.HMS Belfast is permanently moored beside Tower Bridge and is open as a museum. 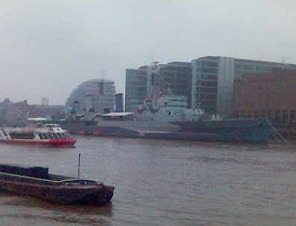 And its 12.5 miles for a shell to travel from HMS Belfast to MSA. 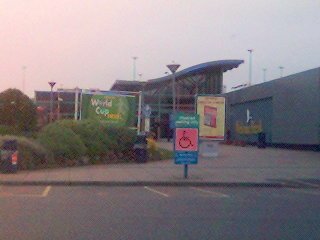 A one site services, located on the Northbound side but accessible by southbound traffic by a bridge. At the site of the non-existent Junction 3. Originally, J3 was to be a link road between M1 and A1. 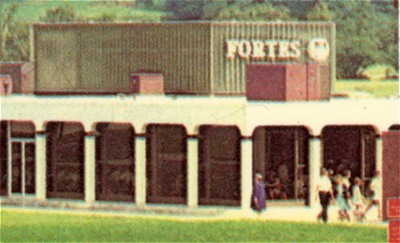 This was never built. 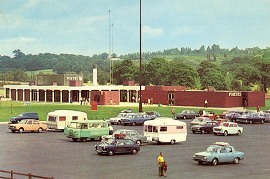 The bridge was then used for the services- allowing southbound traffic across the motorway to the services. Built on a disused railway yard. A study by University College in London found that the first services outside a city gained 50% more trade than others. 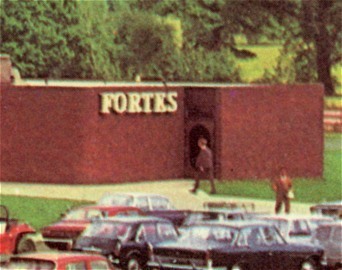 so Fortes went to town in designing this site, as both an advertisment for other Fortes services, and also learning by the mistakes of the other sites that had been developed in the 1960s. Scratchwood- as first built. Today you won’t see all this beautiful architecture, its all been covered or replaced. Its just too good so lets have a closer look. No sharp edges here, even on the walls. This part of scratchwood looks a little Spanish in influence. A world away from the typical boxes of the 1960s. please am looking for Anny Berd,from scrach wood.she is like a mother to she lookd after me when i was in school and i cant faind her again please help me to see her. thank you. I remember stopping at Scratchwood Services when I drove to Northampton from East Sussex during the 1970,s and early 1980,s. Had to drive through London in those days as M25 was not completed. 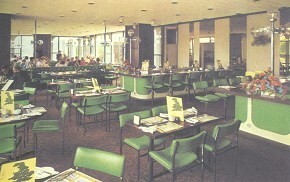 Being close to the start of the M1 in London, Scratchwood was a welcome stop for a comfort break and cup of tea.